Bulgarian MEP Ilhan Kyuchyuk calls for the United Nations to recognise that nominating Irina Bokova to be the next Secretary-General is the best way to fulfil principles that the UN agreed upon almost 20 years ago. Ilhan Kyuchyuk is a member of Bulgaria’s Movement of Rights and Freedoms, affiliated to ALDE, the Group of the Alliance of Liberals and Democrats for Europe. The UN website carries a recent posting on the arrangements that have been put in place to select the next UN Secretary-General acknowledging that traditionally the selection process carried out “behind closed-doors by a few powerful countries” and makes the claim that in 2016 the process “will for the first time in history involve public discussions with each candidate campaigning for the world’s top diplomatic post”: this is true to a point, but only to a point. On this occasion there has indeed been a more open nomination process than has been the case in the past – it could hardly have been any more secretive – and there have been public discussions. These changes, while welcome, barely scratch the surface. The process to select the candidate who will replace Ban Ki-moon remains deeply flawed. The actual selection will be made behind closed doors in the UN Security Council. While a series of straw polls on the candidates are being taken amongst the 15 members of the Security Council the final decision will, as always, be made by the five permanent members: the US, Russia, China, France and the United Kingdom. These things will take time to change – if indeed they are ever changed – however there are two glaring inadequacies in the selection process that do not require a lot of effort to put right. First, the most obvious gap in the UN system is that in 70 years the UN has never appointed a woman to be Secretary-General. Given that the UN’s charter speaks of equality, of human rights and fundamental freedoms, the fact that a woman has never been appointed is simply unacceptable. The second injustice that can be addressed in the 2016 selection process is the fact that the Eastern European Group of UN member states has never had a nominee for the Secretary-General position accepted. In 1997. the UN General Assembly adopted Resolution 51/241 aimed at strengthening the UN system. The resolution set out three general principles to apply to the process of selecting a nominee for the position of Secretary General. It provided that the process should be more transparent, that gender equality should be incorporated into the process and that the Secretary General post should to be rotated amongst the five groups of member states into which the UN is divided. In 2006, when Ban Ki-Moon was appointed there was a concerted effort to have a woman selected for the position. Even Kofi Anan the outgoing Secretary-General suggested that his successor should be a woman. Although the well-respected President of Latvia Vaira Vīķe-Freiberga was nominated by Estonia, Latvia and Lithuania, her name was not selected to go forward. The explanation made at the time was that no woman was nominated by the Asia – Pacific UN States from which, under the regional rotation arrangements, the 2006 nominee for the post was due to be selected. President Vike-Freiberga’s nomination was from countries in the Eastern European Group and was ‘not eligible’ under the ‘rotation rule’. In the 2016 selection process for the next UN Secretary-General there is no such problem. Bulgaria has put forward a woman candidate, Irina Bokova, who fulfils the regional rotation requirement and who has all of the attributes that the UN needs in its next Secretary-General. Bokova’s life experience reflects that of many Europeans in the Eastern European UN Grouping. She has made courageous life choices. Ms Bokova played a key role in the painful transition that Eastern Europe made following the fall of the Berlin Wall. She was one of the politicians with the foresight and the courage to see Bulgaria’s future in the EU and in NATO. 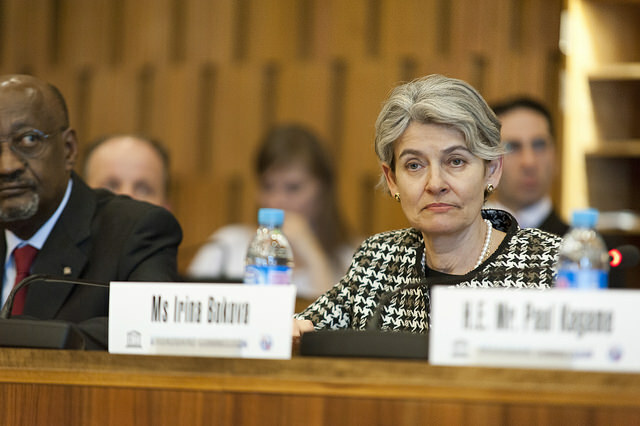 When she was elected to head UNESCO in 2009, Bokova became the first Eastern European to head that agency. Her re-election in 2013 demonstrated the trust that member nations were willing to put in her. UNESCO today is a much stronger agency than it was when Bokova took charge. As the DG of UNESCO, Bokova has had to deal with the political minefields of the Middle East and has done so without ruffling too many feathers. She has been firm but diplomatic. In the race for the top job at the UN it is inevitable that there will be some political ‘push and shove’. Rather than damaging Bokova the campaign has strengthened her and shown a side to her character that has surprised many people. She has demonstrated steely determination and dignity in equal measure. Bokova clearly has the attributes that the UN needs at this time. Apologies, I may have blinked, but can someone remind me what UNESCO has achieved under Bokova’s leadership, or in the past two decades for that matter? I can’t imagine why we would support a candidate from the EU. I’d be wielding the veto against any candidate from the EU which is well short of being a democracy.